The Ōhen Hakkyoku is a collection of nine Ihatsu (or kenjutsu) kata starting with the sword already drawn and ready for combat. The character ō 応 has the meaning of “responding to or complying with” while the character hen 変 carries the meanings of “change, incident or trouble”. Hakkyoku 八極 expresses the idea of eight (meaning all) directions according to ancient Chinese thought. Therefore Ohen Hakkyoku 応変八極 carries the meaning of “being able to adapt to changes from any direction.” In this work, phrases like “I think that… ” and the like appear. The “I” this refers to is the second head of Katayama-ryu, Katayama Hisataka (1626-1699), the author of the Heisō Jirinden. Justice changing into injustice or fortune into misfortune happens like morning turning to evening or day turning to night. If one does not know the morning, they cannot know the evening. If one does not know day, obviously they cannot comprehend night. One who, like a child, does not understand the way of things is unable to respond to change. Naturally responding to change is waking in the morning, working in the day, finishing in the evening and sleeping at night. If nothing comes to an end, there is no change. Winter comes to an end and becomes spring. Summer comes to an end and becomes fall. For something to end means it has reached its limits. Something good becomes something bad and something bad becomes something good. The Ōhen Hakkyoku explains this using the change in all things and teaches how to adapt to and deal with change. Being able to deal with various changes well is simply “sei” 正 (something correct). The eyes of the gods pause at the moments when man and things come in contact. Therefore the good and evil people keep inside appears through their eyes (gan 眼). The kenjutsu techniques explained here are for when a man interacts with outside forces, so it is important to know from the outset the importance of the characters sei 正 and gan 眼. The character sei 正 means “correct or to do correctly” and the character gan 正眼 means “eyes”. Therefore Seigan 正眼 means “to view things correctly or to have correct perception”. I think that this does not mean that one’s perception becomes correct when they come in contact with something. Rather it means to not lose the correctness one always has. If one’s perception is always correct, one will be able to instantly deal with a situation when viewing it anew. There is no reason consider a situation more than this and become confused and this reaction is fast. This is what is called Seigan. In the oral teachings the following is said. 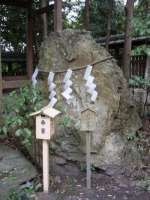 Seigan is shown in a peaceful times without incident in the form of uniting those above and below and making them of one mind. It has been passed down that Seigan‘s correct perception is of the speed that the human eye blinks to avoid dust and dirt. The most important thing is that one must act with correctness at all times, like the sun rising everyday in the east and setting in the west. When facing an opponent’s attacking sword, one receives it while “shaving the back of the blade.” The correct posture for receiving an attack is, if the enemy cuts nothing but air and does not strike one’s body, to deftly advance forward in a low posture, aligning the angle of one’s blade to the left shoulder which is pulled in. One advances close to the enemy while receiving their attack and then attains victory. The character ga 臥 means “to lie down or recline” and the character ryū 龍 means “dragon”. Therefore Garyū 臥龍 means “a dragon at rest”. I think that a dragon, by virtue of being a dragon, lies down and does not move until it is inevitable. Originally a dragon’s movement was confined to drawing of water from a marsh. A cloud is naturally free from obstructive thoughts and a dragon free from desire. There is no harm caused in a cloud and a dragon accepting each other and acting as one. This relationship between a cloud and a dragon can be likened to a warrior wearing a sword. With the exception of a warrior giving up his life in the subjugating of injustice, he should not make use of the sword until the very end. Keeping the sword in its scabbard and not drawing it under any circumstance, this is what is called Garyū. In the oral teachings the following is said. Keeping the sword in its scabbard and not drawing it to the end means that while the blade is at rest, the mind does not sleep. For example, even if there is an enemy, if he is not actually attacking, there is no need to engage him. One example given of the virtue of the dragon is having the edge of the blade is lain downward with the pommel climbing up to the left side of the chest, touching near the breast and as the enemy approaches, there is no in attentiveness in the dragon from head to tail with its true form remaining hidden. When receiving the enemies attack, if one extends one’s hands and the sword becomes distanced from the body, one will lose. Because of this it is important to pull in one’s hands, having the pommel touching the left breast and receive the enemy’s sword on the back of the monouchi (the last several inches of the blade primarily used for cutting). Sink the body and distance one’s self from the edge of the enemy’s blade. The head evades and then respond to the enemy with the tail. The character sa 左 means “left or to move” and the character ryū 龍 means “dragon”. So Saryū 左龍 has the meaning of “a dragon forced to move out of necessity”. According to my thinking, sa 左 has the same sound as sa 作, meaning “to make or to move”. In this school we use the character sa 左 with the meaning of “moving out of reluctant inevitability”. In old times, warriors valued the right and had contempt for the left. The original spirit of the sword is that it is a tool to protect against injustice. There is nothing one can do against a corrupt and unjust individual. But even if it was inevitable to subjugate the unjust person, that act greatly reduces one’s virtue. If one properly uses the sword, there is no need to cut an individual down. This is what is called Saryū. In the oral teachings, the following is said. Long ago, the characters Saryū 差龍 were used. Ryū was said to be not showing one’s true form and adapting, while sa 差 was said to be “a small discrepancy”. The meaning of this is that if one is lax in spirit and not vigilant for even the shortest of times, a large error can result. The technique Saryū is when one cannot return to Garyū and one receives the enemy’s attacking sword at the right hip and then continues in the manner of a dragon moving freely. The character ko 虎 means “tiger” while the character ran 乱 means “to lapse into chaos or to subdue”. Therefore the meaning of Koran 虎乱 is “the subduing tiger”. According the my thinking, the tiger lives in a bamboo thicket and defends against various animals. This has the meaning of subduing chaos (ran 乱). The way of protecting oneself against a foolish person is to put priority on one’s own correctness and not have a spirit of controlling through vigilance. The tiger in a bamboo thicket defending against other animals is an example of not showing your tools of battle, like a lion not showing its fangs or a ox not showing its horns. One develops the bravery of all animals by showing bun 文 (learning or knowledge) on the exterior and keeping bu 武 (or budō 武道, martial skill) internally. In the oral teachings the following is stated. A person who has bun on the outside and bu on the inside is not hated even in the midst of a great number of people and is calm while entering a large crowd. He has no intent to be ready and attack an enemy on his own, nor the selflessness to hinder an ally. His way of using the sword is to not attack, nor defend, but to be skillful when striking and able to attain victory when defending as if his sword has no scabbard. Having bun on the outside and bu on the inside means that one has the skill to instantly respond and defend. The governing of one’s country should be just like this. The character u 右 means “right or to help” and the character hotsu 発 means “to release or to emit”. So Uhotsu 右発 means “to subjugate in the assistance of others”. According to my thinking, the meaning of this is a retainer assisting his lord in the overcoming of injustice. U 右 has the same meaning as u 佑 (to rescue) and is said to be “a helper of the gods”. One should act with goodness of character and exemplify this to others by cultivating oneself and keeping the sword at one’s hip firmly closed in its scabbard. Bu means to abandon violence and there should be no inclination towards killing. If someone returns to correctness after contemplating and then abandoning some incorrect action, one only has to forgive them. This is what is called Uhotsu. The following is said in the oral teachings. A foolish enemy who does not understand things that should not be done will be completely unable to approach an individual when that person is completely prepared in the manner of Seigan and has not even the slightest opening. Such a person is one who forgives those who are trying to returning to the proper way of things. When such a person does approach it is said that one assails the enemy while following the true path of the heavens (that is, the natural order of things). If the enemy is also one who understands the way of the heavens, he will quickly return to a peaceful state. The character sa 左 means “left or to help” and the character hotsu 拂 means “to ward off or drive away”. So the meaning of Sahotsu 左拂 is “to assist by driving away”. According to my thinking, this means that a retainer receives orders from above and quickly does the unavoidable and drives off a wicked man while esteeming righteousness and making light of death. Sa 左 has the same meaning as sa 佐 (to assist or help) and means to help people. An unjust man is one who does not understand the way things are originally supposed to be and thus acts incorrectly. Correcting such people by forgiving them and teaching them the proper path is good. One must not enjoy the act of killing. This is what is called Sahotsu. In the oral teachings the following is said. It is not easy to correct one who is acting mistakenly. This is because you yourself have slight imperfections. So one must quickly mend one’s own mistakes and then should persuade the individual not following the proper path to change his ways while acting in correctness yourself. As a rule, the rotation of the sword is divided into the way of the heavens and the way of the earth. Uhotsu is the way of the heavens and the sword rotates in the direction of northwest, through west to southwest. Sahotsu is the way of the earth. The sword rotates in he direction of northeast, through east to southeast. This is said to be winning by abiding by the enemy’s movement. This technique is killing the sin, but not killing the person, the theory being to knock the sin down by means of knocking their sword down. This means to knock their sword down but not injury them. The character sha 車 means “wheel or something that rotates”. Sha 車 has the meaning of “overpowering injustice by abiding by the way of the heavens”. According the my thinking, the rolling of a waterwheel by carrying water or the spinning of a pinwheel by the wind happens not because the wheel relies on the power of the wind or water, but because the wheel regulates and controls the power of the wind or water well. A wheel that spins well is one that is able to take full advantage of its own movement. This is being able to understand a situation well and retreat when a wicked man comes to do one harm, thus extending one’s life. This is like a wheel spinning due to the movement of the wind or water. When you extend your own life, wickedness is here subdued. This is the heavens taking control over wickedness. One acting in accordance with the power of the heavens is controlling wickedness. This is what we call Sha. The following is said in the oral teachings. When the momentum of injustice (that is to say the enemy’s attack) is strong, support one’s sword along the body, not separating from it in the least and, understanding one’s situation well, wait for the right time while avoiding the enemy’s attacks. Never should one think of trying to win and instead advance to an advantageous position while avoiding disadvantageous ones. Sha is a battle array (that is to say the deployment of troops). One should be in the center and respond in all directions. 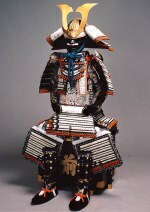 The character kō 甲 means “armor” and the character san 山 (or zan) means “mountain”. Therefore Kōzan 甲山 means “like armor or a mountain”. I think that kō 甲 is the character kō in a rhinoceros beetle (kabuto mushi in Japanese 甲虫). San 山 is the san in sangaku 山岳 (mountains). This name is taken from that form of heaviness and firmness that only moves on its own accord. A warrior must have this sort of firmness and heaviness. Even though the armor of a rhinoceros beetle is hard, there is a reason for this and it still continues to grow. Even though a mountain does not move, it can still change shape at certain times. When a warrior uses military force, if his actions conform to the ideal of ultimately abandoning violence, it will be acceptable even if he kills people above or below him. It is not necessary to desist in taking an action simply in order to protect some minor norm of behavior. This is what is called Kōzan. In the oral teachings the following is said. One must make it a policy to act to bring all of the lands under control quickly without doubt or hesitation when the opportunity presents itself. One must prepare oneself so that one’s body is as solid are armor and one’s spirit is a state as calm as Mt. Taishan (Taizan in Japanese, a mountain in China said to be a holy place). It has been said of old that one receives or blocks upward twisting one’s body within the confines of the sword, spiraling upward like the shell of a conch or turban shell. The character ko 虎 means “tiger” and nyū 入 has the meaning of “to enter”. So Konyū 虎入 has the meaning of “entering the tiger”. I believe that this is the path (or way of living) where one performs sincere acts with a heart of sincere devotion. A man who sees a stone, believing it to be a tiger, fires an arrow at it, sinking the arrow into the stone all the way up to its feathers. If there is a man who doubts whether an arrow can penetrate a stone, he is an individual who is unable to adapt to changes in things from any direction. One must not try and become enlightened to the reasons behind everything with such an individual. In the oral teachings the following is said. This sinking of an arrow into a stone up to its feathers is, if a benevolent ruler teaches this to the people of his domain, opening one’s eyes and ears to hear the teachings, even if it is with a heinous and dishonest man. This is an arrow penetrating a stone. When a loyal retainer decides to accomplish a task given to him, even if it is extremely difficult and painful, he will be able to accomplish it without causing injury. This is like thrusting one’s fist down the throat of a tiger (an additional teaching of the ryū states that if one thrusts one’s fist down the throat of a tiger, the tiger will be unable to bite). When one is helping an individual, one acts with all of one’s ability, looking right and changing one’s mind on the issue, looking left and reflecting on it, one relies not only on prudence, but acts on the will of the heavens exactly as it is. Make Konyū 虎入 the spirit (rei 霊) of fidelity (chūshin 中心). I believe that chūshin 中心 is fidelity (chū 忠). Chū 忠 is the carrying out of one’s duty for the sake of others. Rei 霊 is the soul (the energy that governs one’s mind and physical body) and is the foundation upon which people live their lives. That is to say one should not forget to keep Konyū inside one’s heart and live as if it where the spirit residing in one’s body. The oral teachings say the following. Not forgetting to keep this inside one’s spirit is does not apply only to Konyū. It is applies also to Seigan. Konyū and Seigan are one, and the remain seven techniques must be performed in accordance to these two. Understand it is for this reason we use the name of “eight directions” (hakkyoku 八極) to these nine techniques. 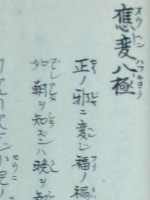 This is the same for the techniques of Empa 圓波 to Ukifune 浮船 of the Iai Hakkyoku-hen 居合八極変.